Day four of my wife-induced father-son bonding started out with David whacking me in the head with a bag of marshmallows at 06:30 in the AM. It was my own damn fault. A few weeks ago, I found the only store in Germany that actually sells American marshmallows. My mistake was buying them. I realized this directly after leaving the store and promptly hid them in the closet next to the soap and shampoo. They'll never find them. Last night, I made the brilliant decision to put the marshmallows out on the kitchen counter so that I wouldn't forget to bring them to today's big BBQ at Grams & Opa's. David's early morning face-bashing was apparently the unwanted backup reminder. Thanks, buddy. Today is May Day, a public holiday in Germany where people get drunk on wine and climb mountains. That's at least my understanding; it might be that the locals have a different interpretation, but it does mean that all of the surrounding hills are packed with inebriated hikers. For some strange reason, this is also the day when Opa likes to dust off his tractor and head to the hills. As we plowed our way through crowded hiking trails, we had an interesting mixture of glares. Some people were pissed off because they disapproved that we were not walking. Others were irritated because we made them move out of the way. The loud clanking of the engine helped matters almost as much as Opa's horn honking. A few of the truly shellacked actually waved and cheered. On one particularly steep incline, Opa had to stop. A friendly drunk lady immediately stumbled to the back and pretended to push the tractor up the hill. Opa took no notice, though, and kicked in the clutch to switch gears. By doing so, the tractor rolled back down the hill and almost killed the hammered trekkerette. I laughed of course, but luckily the roar of the tractor muffled my snickering. The sun was shining and even the loud put-puttering throughout the entire tractor ride could not mask the incessant giggling and laughing. 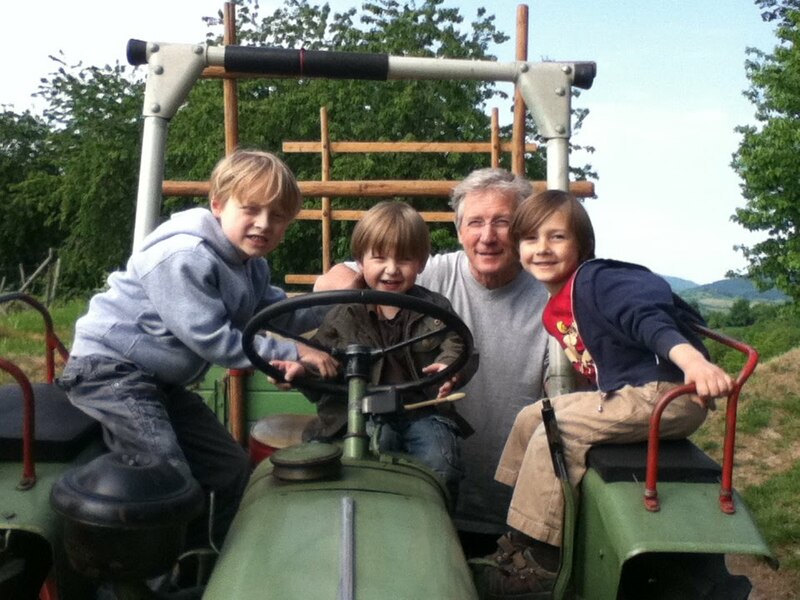 The boys had a blast, especially when Opa pulled over to allow a happy trio of wine connoisseurs to hitch a ride. We made it back to the ranch and Opa fired up the grill. 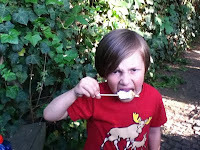 David immediately started screaming 'MARSHMALLOWS!! ', but we (me) agreed that David should wait until after dinner. In Germany, they cut meat differently than in the States, so it is simply not possible to get some cuts, like rib-eye steaks. Unless, of course, you are Opa. Somehow, he coerced a Western-oriented butcher to fill my belly with a little touch of home. And it didn't involve Budweiser. David chowed down faster than I have EVER seen him eat. After a satisfied burp and the slight dabbing of a napkin, David stood up. David, like his mother, tends to ignore pure wisdom, even when it's delivered by a highly intelligent and sexually attractive male with a well-developed physique and a penchant for naggy women. As I watched David lift the flaming sugar barrel to his lips, I contemplated yet another warning, but then I suddenly remembered being beaten awake by a four-year old punk with a bag of fluff. Go for it. Peter: When Davey go so crazy for the mar'mellow. David: Papa, it was that marshmallow; you know this already. Tom: Opa and the tractor, so loud, so funny. Peter: When Davey burn him in the mouth. 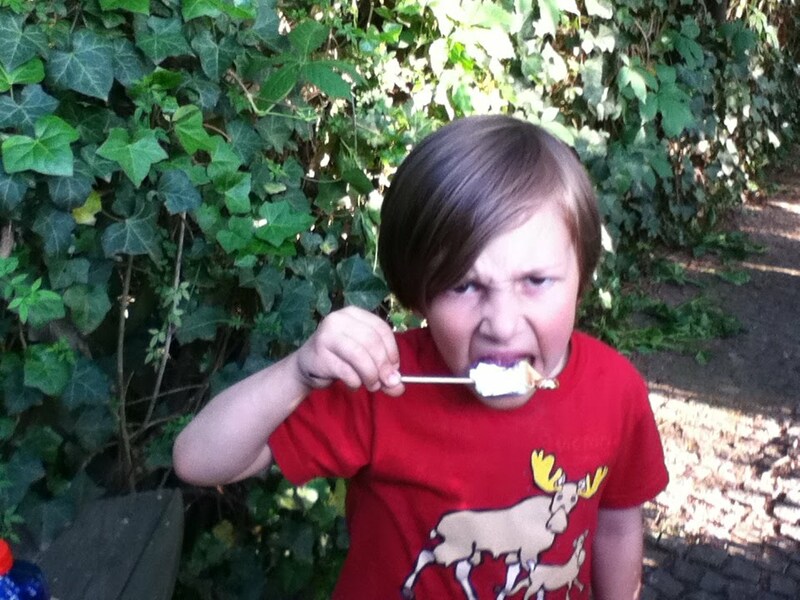 David: When the marshmallow, he too hot. Tom: Davey cry, so hot. Peter: I want to go roller-blading with no helmet. David: I want to do a Lego trap for you. Tom: Apple juice and cheese, Papa.